LOS ANGELES (CelebrityAccess MediaWire) — Club favorites Pitbull and Ke$ha are teaming up for a tour of North America this summer. Produced by Live Nation, the tour kicks on off May 23rd in Boston at the Comcast Center, the tour runs through June 28th when the pair will appear in Tampa at Live Nation Amphitheatre at the Florida State. Australia's multi-platinum dance/pop music stars Justice Crew along with DJs Ultra Records' Jump Smokers have been lined up to support the outing. 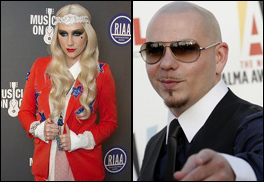 For a preview of the tour, check out Pitbull and Ke$ha when they perform at the 26th Annual Kid's Choice Awards on March 23rd. Pitbull will perform his new single, "Feel This Moment" with Christina Aguilera for the first time in its entirety. Pitbull is touring in support of his seventh studio album, "Global Warming," which was released last November, debuting at #14 on the Billboard 200. Ke$ha will be the subject of a new docu-series on MTV called “Ke$ha: My Crazy Beautiful Life,” which debuts on April 23rd.